Sean and Pepper - Besties Forever! Back in July, we introduced you to Shaun, one of our youth volunteers who was working very hard all summer to convince his dad that he was responsible enough to adopt a dog from Young at Heart for his very own. 12-year-old Shaun was on a mission, so he went door to door to his neighbors, volunteering to do odd jobs that they needed done in exchange for a donation to Young at Heart or for a good word sent down the line to his dad. Well, $100+ dollars in donations later and many words of praise sent his dad's way, Shaun's wish has finally come true! 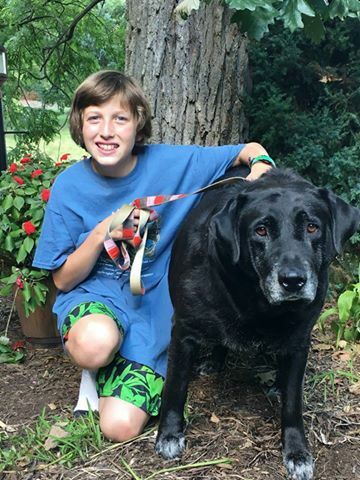 Shaun and his family happily adopted Pepper, an 8-year-old black Labrador, who is wagging her tail now that she has finally found her forever home. We are over the moon that such a wonderful young man is now Pepper's best friend. Shaun, we are so proud of you! Congratulations to you and to your family on your newest family member!